Note: The window appears only when you have selected Plain Paper/Bright White Paper as the paper type setting, and depends on other selected print settings. 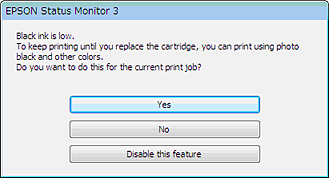 To use this feature, Epson Status Monitor must be enabled. Click Yes to use a mixture of color inks to create black, or No to continue using the remaining black ink for the document you are printing. Click Disable this feature to continue using the remaining black ink. Note: If you disable this feature, it remains disabled until you reinstall the black ink cartridge.